The 21st of September saw us on another great tour of Birmingham’s famous Outer Circle Bus route. As usual we set off from the bus Museum at Wythall with a virtually full bus and picked up a couple of extra intrepid travellers at the start of our tour at Sarehole Mill. With our usual driver Mike and Eddie our conductor for the day we followed our usual format and set of in an anticlockwise direction at 11 am. Not much changes; David gives his guided tour over the PA system and it rained. But nothing was going to spoil the day – our passengers change for every tour (except stalwart Phil – twice now!) and this is what makes each tour so different and so special – the folk on the bus! They were an excellent crowd – all there with their maps, guide books and their own memories of Birmingham and the Outer Circle. As usual we raised money for our chosen charities, Wythall Transport Museum and Asthma UK by selling real 6p tickets from the conductor’s machine, auctioning the lucrative front seats upstairs and relieving everyone of their loose change before we let them off the bus. This time we raised £120.00 – a record – so let’s see if we can do better next week when we do our tour again on the 28th! We were, as always, given a warm welcome by the staff of the cafe at Tesco in Witton so that our circumnavigators could refresh themselves ready for the next half of the tour. Thanks as well to the staff at Wythall Museum who prepared our bus – it looked wonderful (look at the shine on it in the photo above – to be fair it was WET!) and opened up the museum and shop so our travellers could get a taste of what Wythall has to offer. Please go back and take a closer look. On the 14th of October the Museum will celebrate the centenary of the motorbuses’ successful reintroduction by the Midland Red. There will be lots of opportunities for bus rides but you don’t have to be a Midland Red fan to enjoy the day – other types will be running too. Click here for more info. 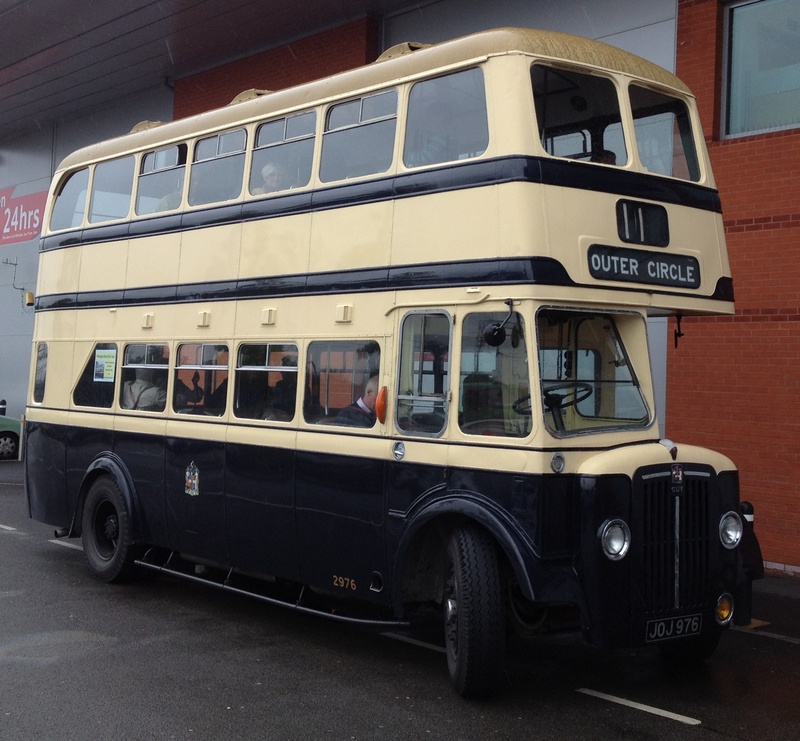 Make sure that you revisit this site to see what we have planned for 2013 – we will be off round the Outer Circle again as well as going on some interesting tours further afield – all on Historic Buses. Finally if any of our passengers from the 21st have any photographs that they would care to share with us we would be most grateful for the opportunity to display them here on our site. Get in touch on our contact us page. This entry was posted in Historic Bus Tours, Outer Circle Bus Trips, Vintage Bus trips in 2012, Wythall Transport Museum and tagged 11-11-11, 1950s Birmingham Corporation Double-Decker, Asthma UK, Birmingham, Birmingham Bus, Birmingham City Transport, BRUM, Bus Tour, Guided Tour, Guy Arab IV, Historic Bus Tour, I want to sit upstairs at the front, Outer Circle, Outer Circle Bus, Ride the Outer Circle, Sarehole Mill, tickets, Vintage Bus, Wythall Transport Museum. Bookmark the permalink.